Our story is based upon values and truisms as old as the wood we reclaim and the barns we dismantle. Boy meets girl, they fall in love, leave their parents home’s, start a life together, start a business together, work hard, endure hardships, persevere and achieve a fulfilling degree of “personal success”. The End. We, Shane and Julie Asselin, started Canadian Antique Lumber Co. Ltd in 1998, with a portable band saw, sawing barn beams in a rented field, after hours of our full-time jobs, and on weekends. Located in Oustic (just outside Fergus) at the time, the “company” largely consisted of re-sawing beams from local barns and in turn selling the planks to antique flooring manufacturers. Before long, we began purchasing in reclaimed material and re-selling for a minor profit. When the family owned sawmill Shane was sawyer at changed avenues, Shane turned his attention to barn demolition full-time. Operating as S&J Barn Demolition, his first barn felling was in Owen Sound in the year 2001. After countless emails sent to antique lumbers dealers throughout North America we got eventually lucky with an order. A heartfelt thank-you to Ken Epworth of the Barn People for taking a chance on an eager but “green” young couple. Our first order of beams was each painstakedly washed and then hand-bombed onto a trailer in a true blustery Canadian winter day. One order, led to another and a barn demolition company for wholesale/resale came to be. It wasn’t long before the waters of Georgian Bay beckoned us back. In 2004 Canadian Antique Lumber moved back home to Midland, Ontario. Throughout the years our company has grown, to include three “little barn wreckers”. We maintain a picturesque 5 acre parcel of land for storage and distribution of product, overlooking the tranquil valley of the Wye Marsh. A new show room and retail space is currently under construction. 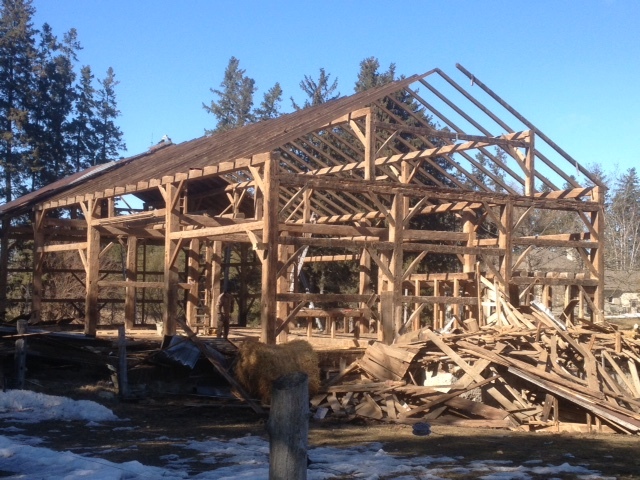 Since our first barn in 2001 we have demolished for salvage over 800 barns, dismantled 40 for kit-frames and had the opportunity to view first-hand the quality and craftsmanship our forefathers put into their early buildings. We love everything about “antique wood” – the look, workmanship, character and quality that makes every piece truly unique. And that by saving and reusing the lumber from old barns, we help to guarantee a cleaner and brighter future for the next generations to come. Thank you for perusing our site – if you want a more hands-on experience of antique lumber, please come out and visit! We are located at 2738 Old Fort Rd, Midland, Ontario and we would love to show you around, but please call first to make sure we are available.